Step One : First of all you need to turn on the console. Activate your PlayStation 4 DualShock controller by pressing the PS button on the center, then select New User. Step Two: The next screen you will see also gives you the option to play as a guest, which creates a temporary profile whose data is deleted when it’s logged out. Accept the user agreement on the next page. Step Three : If you have a PSN account on a PlayStation 3 or a PS Vita you can port it to your PlayStation 4 by signing in. Step Four : You can create a new account which is in at the bottom. Note : If you already have a PSN Account through which you subscribe to PlayStation Plus, you’ll won’t see creating a new account step. Step Five : For those who don’t subscribe to PlayStation Plus , or those who’ve just created a PSN Account, you’ll be prompted to join the service at this point. PlayStation Plus accounts are required to access free games offered on the PlayStation Network and to play online multiplayer. The subscription fee is $49.99 for a year, $17.99 for three months, or $9.99 for one month. Step Six : Now it’s time to designate the console as your primary PS4. 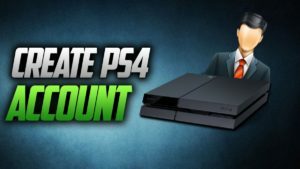 You’ll most likely be creating this account on your home PlayStation 4, so you’ll want to activate that device as the primary console for your PlayStation Network account. Doing so means that the console will locally store your voice and facial data so you can sign into the console just by standing in front of the camera. Step Seven : In this step you can add face data to your account. In the setup you can teach the PlayStation 4 to recognize your face. So, friends this is the most easiest steps to create a PlayStation 4 account. After creating an account you will be able to play games smoothly. So, create an account and play games. Thank you.